This midterm election could reshape Washington. 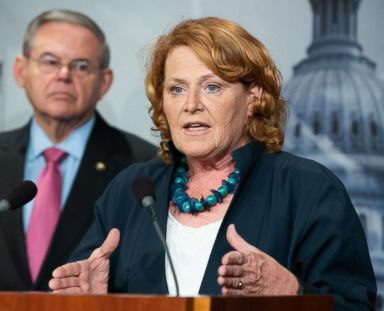 Democrats are eager to secure a foothold in the nation’s Republican-controlled Capitol and are hoping anti-Donald Trump fervor delivers a big blue wave. The GOP, on the other hand, lucky to have a favorable map with many red-state Senate Democrats up for re-election, would love to expand its majorities, especially in that chamber. Every House seat and a third of all senators are up for election. There are scores of new faces in the Democratic Party and a record number of open seats too, as many Republican lawmakers have called it quits. 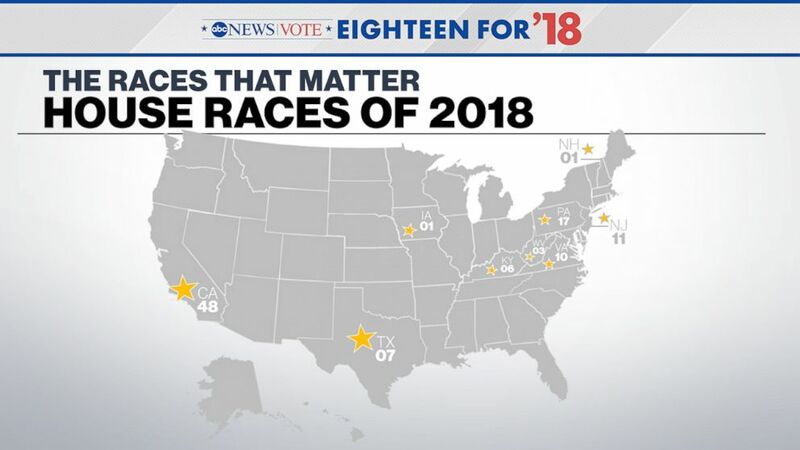 There’s a lot to track, but these 18 races paint a picture of the nation and the storylines and trends emerging from coast to coast. Senate races that matter in 2018. Rep. Martha McSally, a senatorial candidate, celebrates her primary election victory, Aug. 28, 2018, in Tempe, Ariz.
Sen. Jeff Flake’s decision not to seek re-election opened up the seat — and Republican field — allowing the warring factions of the party to vie for the spot. The Republican primary was not only a competition of differing ideas on the border wall and immigration, but also showed the competition between the candidates as they tout their respective ties to Trump. 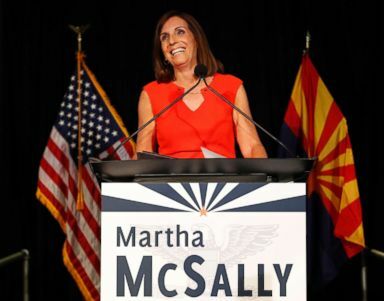 Rep. Martha McSally emerged victorious, trouncing her competitors Kelli Ward and former Sheriff Joe Arpaio. 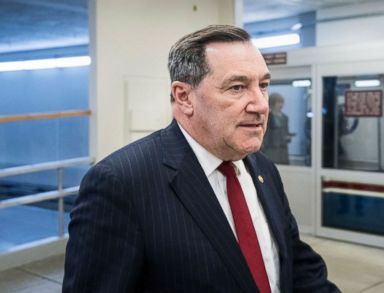 Sen. Joe Donnelly arrives at the Capitol building in Washington, D.C., for a vote, April 10, 2018. In Mississippi, Republicans are scrambling to maintain both of their U.S. Senate seats after Sen. Thad Cochran announced his retirement beginning April 1. Now, they look toward a November special election, strategizing on which of two nontraditional candidates they will rally behind to send to Washington. Complicating the plan is the Magnolia State’s “jungle primary” format where candidates battle in an open election regardless of party affiliation. 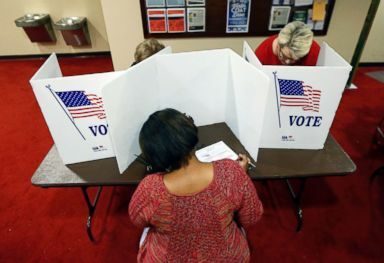 If one person is unable to win 50 percent of the vote, Mississippians will return to the polls once again three weeks later, deciding between the top two contenders. Republican Chris McDaniel, a lawyer and former conservative talk-show host with a large social media presence, is working to fire up his conservative support base, after gaining wide recognition in a narrowly lost primary fight against Cochran in 2014. The Tea Party candidate who originally declared his run against incumbent Sen. Roger Wicker is instead focusing on the special election. McDaniel’s path to Capitol Hill, however, is now seemingly more difficult after an early endorsement by political outsider Bannon. Despite Trump giving his early support for Wicker, McDaniel continues to align himself with the commander-in-chief’s political values. Possibly standing in McDaniel’s way is Gov. Phil Bryant’s interim Senate pick: Cindy Hyde-Smith. The beef-cattle farmer who served as Mississippi’s Commissioner of Agriculture and Commerce since 2011, launched her fall campaign the same day as Bryant’s announcement. Hyde-Smith could make history if she were to become the first woman to represent Mississippi in U.S. history. But one potential wrinkle for the longtime lawmaker is her political past. The former state senator is also a former Democrat, switching to the Republican Party in 2010. And her past affiliation is already fuel to the fire for McDaniel, who immediately noted Hyde-Smith’s Democratic past after the governor announced his pick. But, the Republicans will also have to wait and see who the Democrats bring to the table in the special election as they hope to have a similar outcome as their neighbors in Alabama this fall. Sen. Dean Heller is pictured during a press conference where he announced he will vote no on the proposed GOP healthcare bill at the Grant Sawyer State Office Building, June 23, 2017 in Las Vegas. Nevada is one of the few states where Democrats have a chance to pick up a Senate seat in 2018. In fact, it’s the only state with a Republican senator up for re-election in a state won by Hillary Clinton. Nevada is a quintessential swing state; it has sided with the winner of the presidency for all but two elections in the last 100 years, voting for Gerald Ford in 1976 when Jimmy Carter was elected, and going for Hillary Clinton in 2016 when Trump was elected. 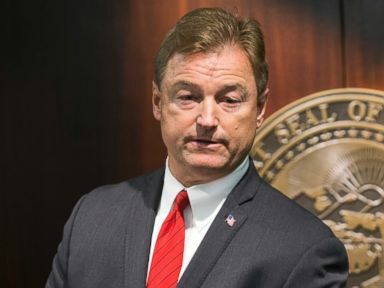 Incumbent Republican Dean Heller was appointed to the Senate by Gov. Brian Sandoval in 2011 and ran to keep the job one year later. Heller squeaked out a win, beating challenger Shelley Berkley by less than 12,000 votes statewide. Will a Republican who won by such a small margin be able to hold on if a blue wave sweeps across the United States this November? Sen. Heidi Heitkamp at a press conference about the proposed Central American Reform And Enforcement Act in the Capitol. 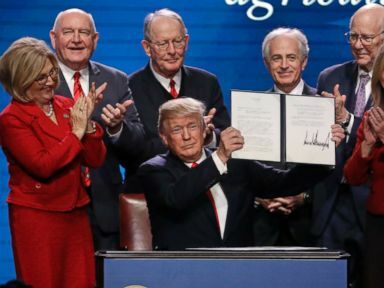 President Donald Trump holds up an executive order after signing it at the American Farm Bureau Federation annual convention Monday, Jan. 8, 2018, in Nashville, Tenn. When Sen. Bob Corker, R-Tenn., announced he would not seek re-election seven candidates — six Republicans and one Democrat — jumped in the race to replace him. Corker’s retirement announcement has left the GOP defending a deep-red seat, which hasn’t been held by a Democrat since 1995. After a crowded field of Republicans vied for their party’s nomination, Rep. Marsha Blackburn emerged as the winner. Democrats got their top recruit in by coaxing former Gov. Phil Bredesen off the sidelines. Sen. Ted Cruz speaks on a variety of topics, including the death of U.S. Sen. John McCain on Aug. 25, 2018, at the Barn Door Steakhouse in Odessa, Texas. 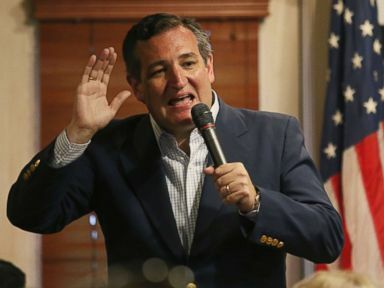 The closely-watched Senate race between Sen. Ted Cruz and three-term Democratic Rep. Beto O’Rourke is one of the highest-stakes contests for both sides previewing local and national story lines dominating the midterms. House races that matter in 2018. Rep. Dana Rohrabacher participates in a press conference on medical cannabis research reform, April 26, 2018 in Washington, D.C.
California’s Orange County is at the epicenter of Democrats’ fight to take control of the House in November, and the 48th Congressional District is the heart of this traditionally Republican bastion in blue California. The district, represented by Republican Dana Rohrabacher, is one of the 23 Republican-held districts that voted for Hillary Clinton in 2016, and Democrats see it as a top pickup opportunity in the general election as talks of a “blue wave” continue to mount in Southern California. Seeking to upend Rohrabacher’s race for a 16th term in office – he’s been in Congress for three decades – is Democrat Harley Rouda, who narrowly won a spot on the ballot after edging out an army of candidates looking for a chance. 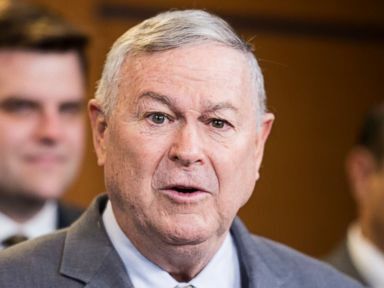 Rohrabacher, a staunch supporter of President Trump, faced his toughest primary yet this year and remains a controversial figure even within his own party, his name most recently surfacing in connection to Maria Butina, the Russian operative indicted by Special Counsel Robert Mueller’s office earlier this summer. Rouda, a businessman and former Republican, is banking on the changing demographics in the district and the growing discontent with the president to make it to Capitol Hill. Polls show him neck and neck with Rohrabacher, who won the top-two primary in June with more than 30 percent of the vote. 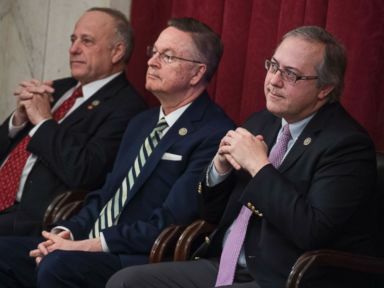 Republican Reps. Steve King, Rod Blum and David Young of Iowa attend a rally for Iowans in Russell Building prior to the anti-abortion March for Life on the Mall in Washington on Jan. 19, 2018. Iowa and politics go hand-in-hand, so it’s not a surprise that the race between Republican Rep. Rod Blum and Democratic State Rep. Abby Finkenauer for Iowa’s 1st Congressional District — which voted for Barack Obama twice, but Trump in 2016 — is gaining national attention. Blum, a former software company entrepreneur, is a two-term congressman and a member of the House Freedom Caucus. A supporter of the president, he ran unopposed in the Republican primary. Finkenauer, a two-term state representative, beat out three other Democratic challengers by a wide margin in the primary. She’s also picked up a number of big endorsements from NARAL Pro-Choice America and EMILY’s List, and could be another example of the “pink wave” sweeping the midterms. A battle of the vice presidents is setting up as well with Pence visiting the district earlier this month to campaign for Blum and former Vice President Joe Biden having endorsed Finkenauer, who served as the volunteer coordinator in Iowa for his 2008 presidential campaign. 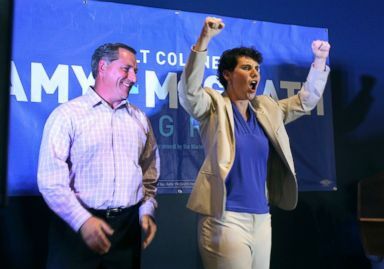 Amy McGrath, right, with her husband, Erik Henderson, pumps her fists after being elected as the Democratic candidate for Kentucky’s 6th Congressional District, May 22, 2018, in Richmond, Ky. This fall, Republican incumbent Rep. Andy Barr will face Democrat Amy McGrath, a former U.S. Air Force fighter pilot, creating perhaps his most challenging defense of his seat since he took office in 2013 as Democrats search for a path to the House majority. Republican hopeful for New Hampshire’s 1st Congressional District Eddie Edwards speaks during a debate at St. Anselm College in Manchester, N.H., Sept. 6, 2018. The outcome in New Hampshire’s 1st Congressional District –- a classic swing seat that flips with virtually every political wave –- will determine where the small, yet powerful district stands looking into 2020. 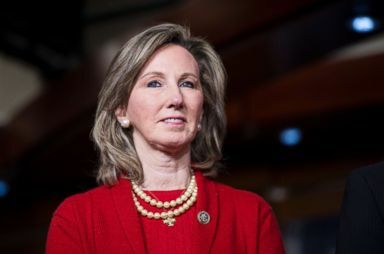 If a Democrat maintains the seat, the party can maintain a momentum going into the next presidential election, but the National Republican Congressional Committee is targeting the district in this election in which Democratic Rep. Carol Shea-Porter is not seeking re-election. The 1st Congressional District covers the Greater Manchester, Seacoast and Lakes Region of New Hampshire, a predominantly white, middle-aged and middle-class population. Seven Democrats, three Republicans and one Libertarian are all vying to fill the seat. A key issue for the candidates will be how they can address the opioid crisis that has become a national public health crisis. New Hampshire has begun to combat the problem with new laws, regulations and kits to avoid the rapidly increasing overdose deaths. In a Friday, May 19, 2017 photo, Mikie Sherrill joins protesters with NJ 11th for Change in Morristown, N.J.
A New Jersey district that went for Trump in the 2016 election and was represented by the same Republican for more than two decades now offers a glimmer of hope for Democrats seeking to control the House in 2018. That’s because New Jersey’s 11th Congressional District only went to Trump by about 1 percentage point in 2016, and its longstanding Republican congressman, Rep. Rodney Frelinghuysen, is no longer seeking re-election. Come November, it’ll be an open seat race. 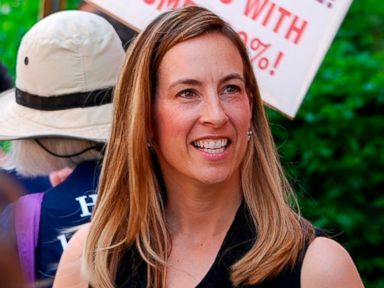 Enter Democrat Mikie Sherrill, a Navy veteran and former federal prosecutor running to upend GOP control of the district, and Republican Jay Webber, a state assemblyman and attorney running to maintain it. Webber calls his Democratic opponent a “Nancy Pelosi pawn,” wedding her to the House minority leader, while Sherrill describes Webber as an establishment politician who backs the president. Sherrill, a mother of four and former helicopter pilot for the U.S. Navy, has never run for elected office before. She joins the race as part of the many so-called “waves” crashing on the 2018 midterms — the record-breaking “pink wave” of female candidates — and has netted endorsements from EMILY’s List and Biden. 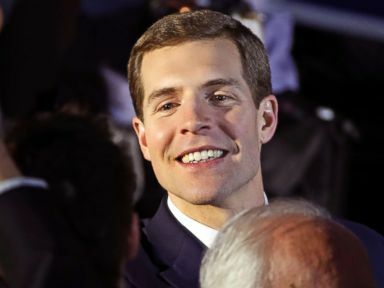 In this March 14, 2018, file photo, Conor Lamb, the Democratic candidate for the March 13 special election in Pennsylvania’s 18th Congressional District, celebrates with his supporters at his election night party in Canonsburg, Pa.
Conor Lamb made national headlines when he kickstarted Democrats’ blue wave ambitions with an upset win in the Pennsylvania 18th congressional district special election in March. But come November, he’s poised to face even stiffer competition. Lamb’s home in the town of Mt. Lebanon, Pennsylvania moved to the 17th Congressional District under the state’s new congressional map, the district within which current Republican Rep. Keith Rothfus lives. Though Rothfus hasn’t faced a significant challenge since his first election victory in 2012, the 17th district is home to a very different group of voters than the congressman’s current 12th district. In addition to Lamb’s hometown, many of the liberal suburbs south of Pittsburgh that boosted the special election upset will join the 17th Congressional District, promising a much closer race than Rothfus might have anticipated just a few months ago. 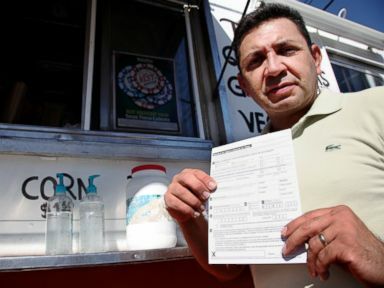 Carlos Zamora shows a voter registration card from a pile placed on the counter of the Tierra Caliente taco truck in this Sept. 29, 2016 image in Houston. Progressive energy is flowing deeply into the Houston suburbs, an area at the crossroads of immigration, changing demographics and hurricane reconstruction — and rising as a top target for Democrats in 2018. Although a Republican has held the seat for 50 years, Hillary Clinton carried the district in the 2016 election -– a major shift after voting for Mitt Romney in 2012. The 7th Congressional District in Texas is predominately white, but about 31 percent identify as Hispanic. Rep. John Culberson, who has represented the district since 2001, has spoken in support of Trump’s controversial travel ban calling it a “necessary pause in the refugee program” until adequate background checks are created. He also supports a bipartisan solution to the debate over the DACA program that is “compassionate” to those brought into the country illegally as children. Immigration is a pressing issue in this district, but there is one name that is still on the forefront of voters’ minds: Harvey. Many families are still rebuilding after the hurricane devastated the area and elected officials are hoping Congress can pass more funding to help Texans rebuild. Rep. Barbara Comstock, participates in the Bipartisan Heroin Task Force news conference on the release of the 2018 legislative agenda for the 115th Congress, Jan. 10, 2018. Stretching from the Washington, D.C., suburbs to West Virginia, Virginia’s 10th Congressional District is the only battleground House race in the capital area. Democratic state Sen. Jennifer Wexton won a crowded June primary to take on Rep. Barbara Comstock, R-Va., a political survivor who hung on to her seat in 2016 despite Hillary Clinton’s win in her district. Wexton has been criticized by her opponents for supporting a 2016 gun law compromise, but has defended her record in Richmond and promised to work across the aisle in Congress on issues like infrastructure and combating the opioid crisis. 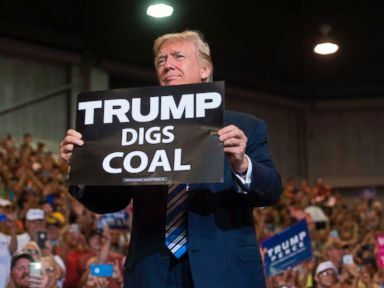 President Donald Trump holds up a “Trump Digs Coal” sign as he arrives to speak during a Make America Great Again Rally at Big Sandy Superstore Arena in Huntington, W. Va., Aug. 3, 2017. Trump won West Virginia’s ruby-red 3rd District by a whopping 50 points in the 2016 election — but a tattooed, retired veteran who campaigns in his Army fatigues has the chance to turn the district blue. Richard Ojeda, a state senator who gained national attention and became a local hero during the state’s teacher strikes, is running as a populist Democrat who can appeal to working-class voters in the heart of Trump country. Taking on Ojeda is Republican delegate Carol Miller. “I’m Pro-Life, Pro-Jobs, Pro-Coal, Pro-Second Amendment, and Pro-Trump, and I’m running to cut the bull out of politics!” Miller states on her website. Ojeda admits he voted for Trump and likes the president’s mission to bring back coal jobs to West Virginia, but he also supports left-leaning policies like legalizing marijuana and a public option for health care. 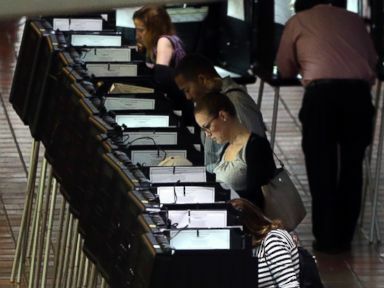 In this Oct. 24, 2016 file photo, people vote at a polling station on the first day of early voting in Miami-Dade County for the general election in Miami. No state is likely as historically consequential in presidential elections as Florida — e.g., 2000 Bush vs. Gore — and we’ve seen just how important national leaders find this race after the Sunshine State’s late August primary in which endorsements and federal politics played a huge factor. Jacksonville Republican Rep. Ron DeSantis easily rode to victory against the establishment favorite, Florida Agriculture Commissioner Adam Putnam, after the president tweeted his support for DeSantis in June. Following the tweet, Trump also campaigned for DeSantis and his Senate race counterpart, Gov. Rick Scott, in Tampa in late July. Tallahassee Mayor Andrew Gillum’s win in the Democratic race, on the other hand, was a surprise. 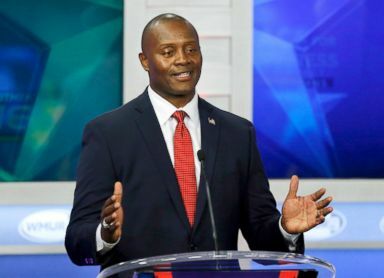 For months, Gillum was trailing Florida political dynasty candidate, former Rep. Gwen Graham — whose father was a beloved senator and also governor of the state — as well as a number of wealthy and self-funding challengers. Late in the race, Gillum received the endorsement of progressive icon Sen. Bernie Sanders, the Vermont Independent, and a generous cash infusion from George Soros and Tom Steyer. Gillum is now the first African-American nominee for governor in Florida and hopes to become the first Democratic governor elected in Florida since 1994. Florida Democrats are hoping to use the election as a referendum on Trump and highlight issues that have affected their state, like environmental disasters, gun policy and economic development. Republicans talk of maintaining the economic growth fostered under Republican Gov. Scott. However, race has become a focal point in the election with DeSantis saying shortly after his primary win the last thing Floridians should do is “monkey this up” by electing his African-American progressive opponent. 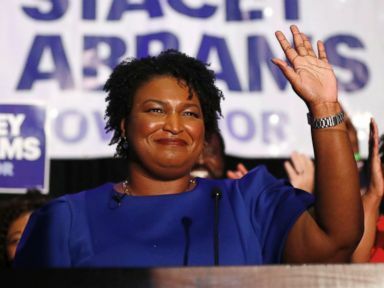 After leapfrogging his opponent and capturing the party’s nomination in the Republican runoff, Georgia’s Secretary of State Brian Kemp will face Democrat Stacey Abrams in a November gubernatorial general election that will test Georgia’s political identity. 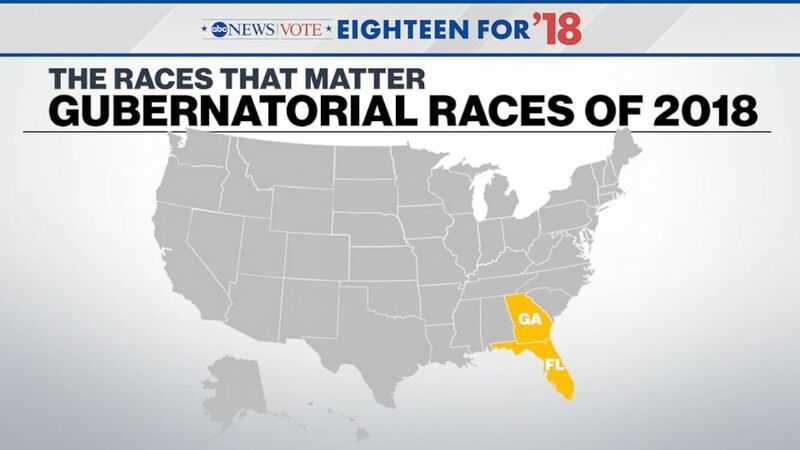 18 For 18’ is ABC News’ powerhouse political coverage of the 2018 midterm elections. To stay up to date, visit ABCNews.com and the ABC News app, and follow our midterm elections alerts.